The various species of the ancient boxwood family have become so familiar to us that it’s hard to imagine a border or garden bed, whether traditional or modern, without at least a few of these beautiful shrubs. Being evergreen, they add a touch of color during the long winter months; slow-growing, they become beloved members of a familiar landscape. Hence a new enemy in the form of boxwood blight has become a cause for considerable concern. This virulent fungal disease made its first appearance in the 1990s in Great Britain and quickly spread to Europe and New Zealand. It has since arrived in North America and Canada, first cropping up on the east and west coasts. It seems quickly to be moving to the Midwest; Ann Arbor Michigan had been spared as of May 2015, but this fungal blight is still a real cause for concern. Cylindrocladium buxicola (the “buxicola” name speaks volumes: it means “living on boxwood”) first becomes apparent in the spring when new growth ensues. Small brown spots appear on a plant’s leaves, which quickly yellow, wither, and drop off. The spots then appear on the stem. Young plants die quickly; older plants may succumb; all are severely disfigured. The fungus that causes boxwood blight spreads through spores remain on the dead leaves. The spores can be scattered further by wind and rain, by animals and people brushing against them, and by infected plants not yet displaying the symptoms of the blight introduced to the garden. Is the Blight Dangerous to the Landscape? Fortunately, the extent of the damage caused by Cylindrocladium buxicola is limited to boxwood. The natural plant life in the area is not harmed by the fungus. 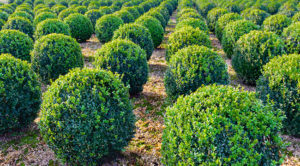 But gardeners and horticulturists are rightly concerned, as are home gardeners who rely on boxwood hedges, topiaries, and other garden elements featuring many of the beloved boxwood species. Is There a Cure for the Blight? Not really. Massive doses of a general fungicide may retard its spread among individual plants. So far the Ann Arbor MI horticultural authorities have been concerned primarily with detection and quarantine. What Can Gardeners in Ann Arbor Michigan Do? Vigilance is the key word. If boxwood species make up any part of your landscape, keep a close eye out for the symptoms of the disease. If you have a substantial portion of your yard and garden planted in boxwood, arrange with a professional landscaper in Ann Arbor MI offering winter services to inspect your plantings. Be especially attentive to yellowing leaves. Don’t let the blight masquerade as ordinary winter damage; again, contact a professional in the Ann Arbor Michigan area who offers winter services. If you’re buying boxwood, be sure that you’re dealing with a licensed nursery. Isolate new plants for at least a month to be sure that you won’t introduce the blight into your garden beds inadvertently. Contact Twin Oaks Landscape today if you have the slightest suspicion of an infestation in your garden.